It's important to know how to treat a dog that ate chocolate since this tasty treat can actually prove fatal to canines. 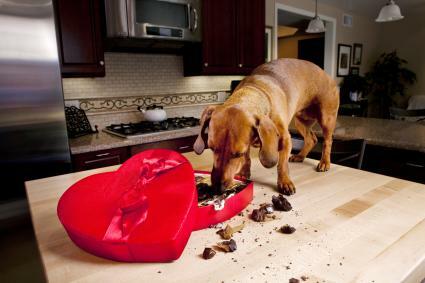 Learn what to do if you suspect your dog has eaten chocolate. If you need to know how to treat a dog that ate chocolate, the safest thing to do is call your vet right away. The vet will ask you what kind of symptoms, if any, that your dog exhibits. This will help him decide if your dog needs to be brought to the clinic as an emergency of if home treatment may be enough to take care of the situation. Other helpful information you can provide includes the type of chocolate eaten, how long ago your dog ate it, and how much your dog weighs. This will help your vet calculate the potential toxicity of the chocolate. If the dog just ate the chocolate, vomiting is one of the best things for him because he will purge some of the chocolate, thus limiting the potential for a toxic reaction. The vet may advise you to give your dog syrup of ipecac to encourage vomiting. The dosage is based on your dog's weight, but a single dose of 1/4 teaspoon may be enough to make your dog throw up after eating chocolate. If you don't have ipecac on hand, there are other ways to induce vomiting in a dog that ate chocolate. Your vet may advise you to administer a solution of equal parts water and three percent hydrogen peroxide. You should consult your vet to be sure of the correct amount to give your dog, but the general rule of thumb is one tablespoon for every ten pounds of weight. Whether you use ipecac or the hydrogen peroxide and water mix, you should wait 15 to 20 minutes after the first dose to see if your dog begins to vomit. If he doesn't, you can administer just one more dose. If that dose isn't effective, it's time to take your dog directly to the vet. Of course, you won't need to give your dog either remedy if he begins vomiting on his own. In that situation, you can continue to monitor him and watch for further signs of toxicity. If he doesn't return to normal after vomiting, update your vet on the situation and take your pet to the clinic. Vomiting helps purge theobromine from your dog's tummy, but there's still a chance that the chemical has already entered his bloodstream if it has been in his tummy too long. After the vomiting has subsided, you can give him activated charcoal if your vet thinks that is wise under the circumstances. The charcoal binds with the theobromine to help it pass harmlessly through the system. Use activated charcoal powder and mix it with some water according to the directions on the package so it's easy for your dog to swallow. Small dogs should receive a one teaspoon dose while dogs larger than 25 pounds should receive a two teaspoon dose. Never try to administer activated charcoal to an unconscious dog. A 15 pound dog eats 1 ounce of unsweetened baker's chocolate. This would be 33 mg per pound, which would be a dangerously high level. On the other hand, if a large 100 pound dog eats 10 ounces of milk chocolate, he would have about 6.5 mg of methylxanthine and would show little, if any, side effects other than possibly diarrhea. If you prefer not to do the math, you can use an online dog chocolate calculator. When Will Chocolate Cause Death? Figuring out exactly how much chocolate a dog can eat without dying, or how much will cause death itself, is complicated. It depends on the type of chocolate and the condition of the dog. For example, 18 mg per pound of bakers chocolate might make a healthy adult seriously ill, but kill a senior or puppy dog. The length of time it's been in the dog's system also makes a difference. It may not kill the dog if it's thrown up in an hour, but it might if it's still in there a couple hours later. If you suspect your dog has ingested close to 18 mg per pound, has health conditions, or has not vomited (or any combination of those three points), you must get the dog to a vet to prevent death. In extreme cases, your dog will have seizures and fall into a coma. Death will be caused by your dog having a cardiac arrest brought on by the chocolate toxicity. In most cases, dogs will simply have an upset stomach along with some other mild symptoms for about two to three days. 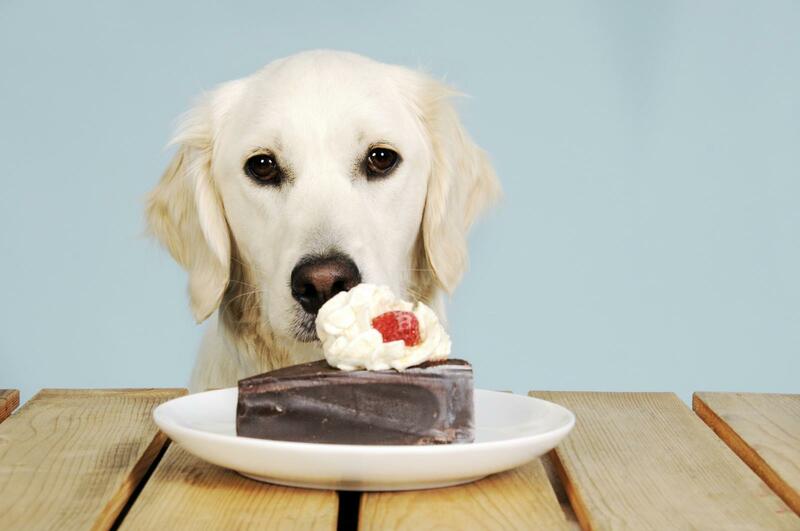 Dogs that have reached the seizure and collapse stage are more likely to die from chocolate poisoning as well as geriatric dogs and puppies. Although these home treatments can be helpful, they are not meant to replace professional veterinary advice and care. If you suspect your dog ate any kind of chocolate (candy, cocoa powder, chocolate cake, etc. ), call your vet right away before attempting any home treatment on your own. If your vet isn't available, call the ASPCA's animal poison control hot line at (888) 426-4435 or the Pet Poison Helpline at (855) 764-7661. Be aware that both services charge a fee of approximately $65.00 although they will open a case to consult with your veterinarian for no additional costs.